We spend this last weekend helping others in various community projects around LA (we do this annually every MLK weekend). 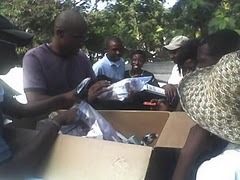 At the same time our hearts and prayers were with our brothers and sisters in Haiti. Randy Jordan, the CEO of HOPE worldwide, happened to be at our local worship service, where we collected $8200 to help out. He shared with tears an update he’d just received via text that two brothers who made a treacherous journey to reach members of our church there in Port au Prince (over 400 members, 150 still missing) had made it there just in time as the disciples’ food and supplies were running out. This song is dedicated to HOPE worldwide and to all who give their “time and heart away” in helping others. Feel free to download and share this song. Great stuff Brian….. I appreciate how the Spirit is working in your life. Much love and appreciation. Just marvelous! thanks for your inspiration. I Love this song! My name is Trish Torline and I teach band at Conkwright Middle School in Winchester, Ky. I am also a Christian Artist. The purpose of this post is this … to raise money for our band program we hold a dinner theatre in which the kids perform as well as serve our guests. Our theme this year is “i am second”. “People Helping People” is perfect for the event. I wrote the song for the closer and would like to use this as the opener. Do you have tracks available? I have several kids that sing as well as one who raps. I really would love to do this. Happy to pay for the track and support your ministry. Please contact me at Tat129@aol.com or 859-556-0353. We used that song in our Day on HOPE video for Metro L.A. I LOOOOOVE the acoustic version!!!! You’re so awesome. It is incredibly awesome. the beats, melody…wow!!!!!!! But most importantantly the message and the reason of that song touched my heart. Keep it up bro. I always check the news about our brothers and sisters in Haiti, and I am with you in prayer for them. It is my singular honour to thank all the people of good will that have come up to extend all forms of assistance to bring hope to the Peole of Haiti. In Uganda, through the ministry of Foreign affairs accounts have been opened to raise funds to help the people of Haiti. It is my distinct pleasure to thank those who are positively responding. Through people, for the people, people can help people. Thanks Hopeworldwide for bringing differences in peoples lives. Finding this song is just more proof that things do come to us when we need it. Our local chapter of “Rebuilding Together” (formerly Christmas in April) just held their community event for the19th year. I will be using your wonderful song for a portion of the video. Thank you for this wonderful message or recognition to those who often seem to get overlooked. Especially in music. That is really cool you found the song and it works well for your project. I hope it goes well! First of all let me just say thank you for being such a true warrior for God’s Kingdom and touching the lives of so many. I was just turned on to your People Helping People song after returning from a convention from a new company named…People Helping People, Inc.! I only wish I would have learned about this amazing song earlier, because I would have loved to have you participate in our convention and our worship service on Sunday. We had nearly 2,000 at our pre-launch event and I would venture to say everyone who heard you sing that song would have bought a CD from you! We are planning to have our official launch in just a few months and anticipate over 5,000 to attend that event. How would I go about contacting you to see if you would be willing and able to sing at a Cororate event? Thanks for your time and all you do. Thanks for the encouragement. Give me an email at jbriancraig@earthlink.net and we can chat about any details – I might be able to contribute. I am a volunteer and the videographer for a charity called “Unity, A Journey of Hope”. We grant wishes for adults living with terminal illnesses. I am getting ready to make a video about some of the businesses that donated their talents and/or items to help us grant a wish to a man living with end stage liver disease. He wanted to give his wife the wedding that she always wanted. We were able to put together a full wedding (suits, dress, food, church, band, decorations…etc) in just 2 weeks because of the number of people and business that stepped up to help out. Although a majority of the video is going to be interviews with video’s of the event and most of the song would be background music used to emphasis the message. I have been looking for a song that would give the video that extra boost. I was wondering if you would allow me to use this song for this video and perhaps, a music video (sometime in the future) about the volunteers. I would give you full credit for the music. Sure, feel free to use it. God bless your work! Thank you! but I guess I don’t know where to get it from. I emailed you the other day regarding ‘People Helping People’ and our PADS (homeless shelter) benefit. You had indicated you didn’t have a copy of the sheet music for this song. Would you by chance have a copy of this song in a MIDI format? I use the clavinova at our church to play many things and I could control things in this song better for our group to sing. Sorry, I don’t. It was all done live. I could mix down a back up track, but that would just take some time to get it done. Let me know if that would be helpful. God bless!